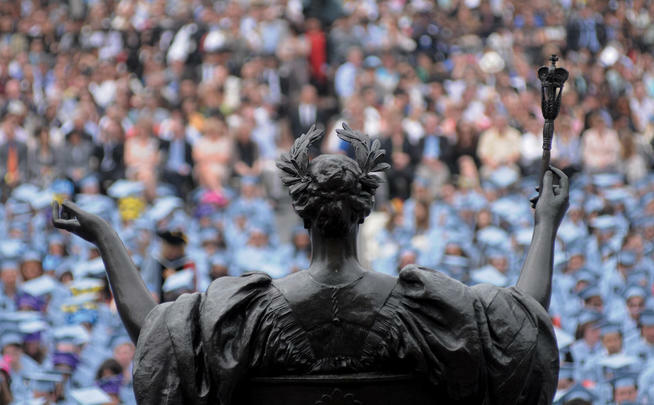 Terrence McNally ’60, the keynote speaker at Class Day, told the graduates, “Your work is just beginning.” PHOTOS: EILEEN BARROSOThe next day, the members of CC ’13 joined some 13,000 other Columbians who officially graduated as President Lee C. Bollinger presided over Commencement. Honored during the ceremony were the 2013 Alumni Medalists, including Stephen L. Buchman ’59, ’62L; Dr. Marvin M. Lipman ’49, ’54 P&S; and Ira B. Malin ’75, co-chair of the Columbia College Fund. 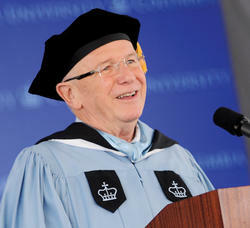 The Class Day keynote speaker was playwright Terrence McNally ’60, a native of Corpus Christi, Texas, who recalled spend­ing his first night in New York City sleeping on the sidewalk outside the Mark Hellinger Theatre, waiting for the box office to reopen the next morning so he could nab a standing-room ticket to see My Fair Lady. “If that didn’t make me some kind of an instant New Yorker, I don’t know what would,” he said. Also speaking at Class Day were Bollinger, salutatorian Yoshiaki Ko ’13 and class president Ryan Mandelbaum ’13. In addition, then-Dean of Student Affairs Kevin Shollenberger present­ed distinguished class awards, Dean of Aca­demic Affairs Kathryn Yatrakis presented academic awards, Columbia College Alumni Association President Kyra Tirana Barry ’87 presented alumni awards and prizes, and Senior Fund Chair Maria Sulimirski ’13 pre­sented the class gift.